I love cherries. In fact, when I was a teenager, I spent a summer working at a side-of-the-road cherry stand and it was one of the greatest treats that as part of my compensation (in addition to a wage) I was allowed to eat as many cherries as I wanted. When I saw the beads that I incorporated into this lanyard, they immediately made me think of ripe Bing cherries and I couldn't wait to find a use for them. 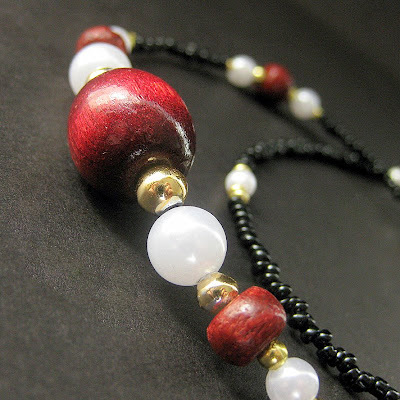 These round wooden beads in a deep shade of cherry have been combined with snow white pearls on a strand of black with just a hint of gold accents in this stylish beaded badge lanyard with a convenient 1 cm ring at the end. Perfect for badge, keys and more, the nape of this strand is created to be comfortable against the back of the neck with decorative beads further down along the strand so they are shown off to their best advantage.